Like most history teachers, I spend my days trying to lure students into awareness of their deep, embedded relationship to the past. With the concluding line of his new book, Howard Mansfield suggests a new strategy: "Throw out your clocks." Our clocks have come to obscure time itself, he believes. "Time is curved, time is braided." It spirals, twists, mists, rains down. To discover time—to discover yourself in it—seek paths beyond the timeline. 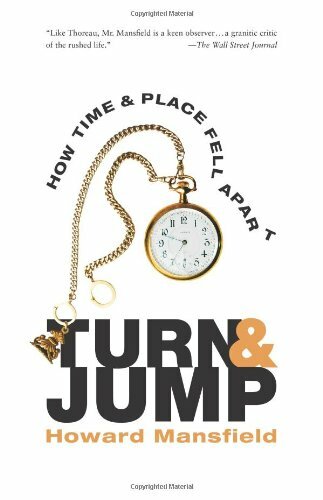 Turn and Jump: How Time and Place Fell Apart is full of them. Mansfield's first pathway requires a quantum leap into Einstein's universe and a rejection of earlier, familiar timescapes. "There are many clocks," Einstein in 1905 proposed. "There is not time, but times." With this clue in hand, Mansfield goes rummaging through his native New Hampshire, searching for clocks that can take him deeper into time, trying to feel his way out of the empirical madness that has reduced time to minute universal increments that only shred human experience. Old journals and almanacs return him to "moon time." A New England mill reminds him that "Once time was a river" but has since become "money." Listen for the ticking, in all of its haunting variety, he implores: "There is always more than one clock in the room." The subtitle of the book leads the reader to anticipate a causal argument: "how time and place fell apart." But Mansfield actually offers more of a meditation on the consequences of this divorce of time and place, leaving the strong sense that the absence of one eviscerates the other. Places that have lost their distinct experience of time, time experienced in transcendence of particular places: both impoverish our perception of life itself. Chapter by chapter, Mansfield takes the reader deeper into worlds familiar and strange, illuminating both this historical process and its human cost. The late 19th-century entertainment breakthrough called "continuous vaudeville," when shows began to roll non-stop through the day, happened just as the railroads standardized time. As by the 1880s the new order brought time-keeping throughout the nation into alignment, human sensibilities adjusted accordingly. Showmen, attuned to the pulse of the people, kept refashioning their acts until finally they were overtaken by film, that stupendous conqueror of time, able to save it, speed it, slow it, split it, make it mosaic. So was time now mastered? Not on Mansfield's watch. "Here was merging with there," and each was losing its meaning. He captures this transformation with particular poignancy in a chapter on the history of a dry goods store in Peterborough, launched in the late 19th century and lasting into the 1980s. Its principal owner, Clarence Derby, authored a multivolume, scrapbook-style history of the store, and Mansfield finds in Derby a soul mate, a man capable of "a documentary about the soul of a store." For him, Derby's book is a priceless effort to keep time in view. Mansfield calls Derby's store "an American clock," one that registered changes "right on time, as if ordered by a social historian": the emerging electronic appliances, the increased role of advertising, the diminishing length of employment, the rise of shoplifting and overdue accounts (in the middle decades of the 20th century, "bad accounts were usually half of one percent or less"). In the end, the "Pageant of Progress"—as a 1941 banner heralding Derby's newly renovated "department store" proclaimed—moved on, finally forcing the store's closure: "Derby's was an American clock and the clock struck midnight." Who controls these big clocks, so intent on crushing the older, smaller clocks? Among the threats Mansfield sees, gigantism looms large: "We have secured an afterlife for money" in the fantastical form of the corporation, "the joint venture that goes on and on." And he refers quietly to "the Empire," that great keeper of the mighty new clocks, devoted above all to making the trains run on time. But this is not a political book except in the deepest sense; Mansfield stays clear of the fruitless ideological blame-game, an indulgence for which it is way too late. His inquiry rather takes him into the soul of the civilization that imagined and countenanced such changes. Turn and Jump ends with a journey back to American origins, to the1670s and Metacom's War, which wracked his region with a violence that left the Indians decimated; in little more than a year, they went from being one-quarter of the population of New England to one-tenth. One moment in the war illumines much for him. Along the Connecticut River in Massachusetts was a place the regional tribes had preserved as sacred, where all could catch salmon in peace. Here on the morning of May 19, 1676, Captain William Turner and 150 colonials massacred 400 elderly men, women, and children. The site became known as Turners Falls. is divorced from deep time, from the true history of the land. For thousands of years this place kept time by the salmon leaping the falls and the Indians gathering to fish. In an instant on one spring morning in 1676, that ended. In another instant, the falls were dammed; the salmon were gone. The river's run has changed; time has changed. Although people may forget, the land does not. Seen from such vantages, "The distinctions we make between years and decades and centuries fall away." Mansfield's metaphysical hunches take him in the direction of the East, which may trouble Christians. But the weight and meaning he ascribes to time shouldn't. Rather, it should provoke. At it turns out, I read much of this book on a twilight flight from Chicago to Portland, jet racing to catch the sun, a missile willed into the air by this mysterious, determined drive to conquer space, to capture time. It's all very heady and exhilarating, our way of life. But everyone knows living begins when you slow down, get off the plane, and look time and place in the eye. What God has brought together, let no man separate. Eric Miller is associate professor of history at Geneva College in Beaver Falls, Pennsylvania. He is the author of Hope in a Scattering Time: A Life of Christopher Lasch (Eerdmans).